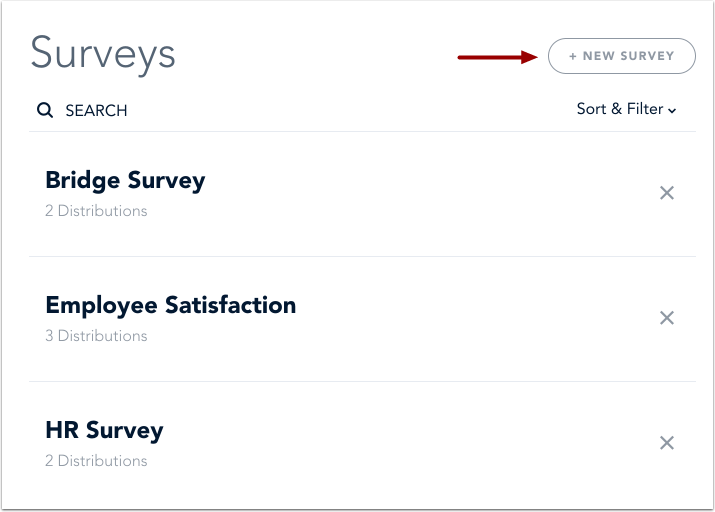 When you add a new survey, you can also add survey content, or you can edit your survey and add content later. On the Surveys page, click the Add New Survey button. In the Untitled Survey field, enter a name for your survey. If you do not enter a survey name, your survey will be saved as Untitled Survey. To add content to your survey, use the default question template  to add a question. You can add additional questions by clicking the Add Question button . To duplicate a question, click the Duplicate icon . Learn how to add survey content. To view survey details, click the Close icon. As you create survey content, Bridge automatically saves your work. You can always view the save status next to the course title. Previous Topic:How do I use the Surveys page? Next Topic:How do I add survey content? Table of Contents > Manage Surveys > How do I add a survey?